Fill up an empty jar with some pink and white sweets – we think marshmallows and jellybeans work the best. Have a guess sheet at hand, then encourage the students to guess the number of sweets that are in the jar. The closest guess wins. Don’t forget to count the sweets before you fill the jar! Our favourite thing about this game is the prize – the entire jar of sweets! Pink bingo! Invest in some pink pens and pencils for this one and get everyone involved. This could work just as well in classrooms as it would as a whole school together, so it’s up to you! Print out standard bingo cards onto pink paper, make your own wear it pink themed cards or even get the students to draw their own. This game is really simple and adds a splash of pink to a well-loved classic. We think that quizzes work really well in the office and our Big Pink Quiz makes it really easy to organise one. Just download our quiz sheets and print off as many copies as you need. With a range of rounds from nature to music, there’s something for everyone. Just make sure you have some good prizes to hand and let the competition begin! Ask all staff to send a fun fact or baby photo of themselves prior to the event. Compile an office trivia sheet, send it round via email or hard copy and get your colleagues to match the fact or photo to the correct member of staff. This is a great way to have fun and get to know your colleagues better. Don’t forget to give bonus points for identifying the boss’ photo or fact! Take some time to pick a selection of pink objects from around your home. This could be anything from a piece of clothing, a mug, or even a piece of fruit. We suggest finding around 15 objects works best. Place the objects on a tray and cover with some material - make sure your guests don’t see the objects until the game begins. Hand out some pens and paper to your guests and uncover the objects for 20 seconds. Take them away and see who can remember the most objects. It’s worth noting that this is much harder than it sounds! Seal those lips and get your guessing game on. Charades is a classic favourite that works well with smaller groups. To get started, you can use an online generator or make up your own list of books, films and celebrities. Then get acting and keep going until your teammates guess correctly. If the time runs out, the opposing team has chance to steal the point – so always keep your thinking hat on! 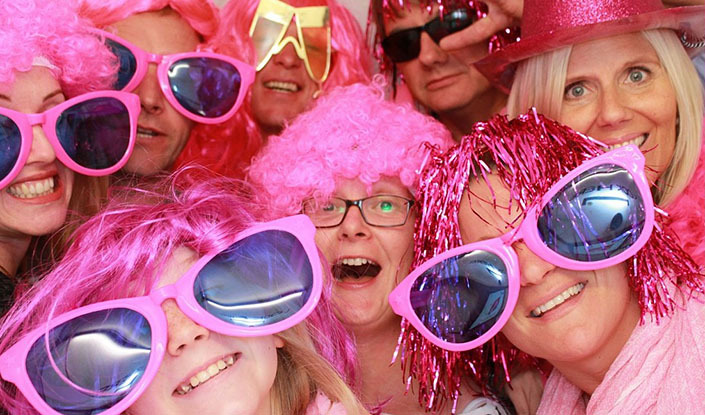 Take a look at our fundraising ideas or get in touch with us at wearitpink@breastcancernow.org.